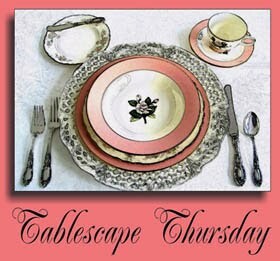 Thrifty Table Chic: Fourteen Dinner sets is enough for anyone.........or is it??? Oh my, great things! I love them all! Really like your picks, you did a great job shopping. Yeah, I know what you mean about expensive in NZ, here in Ecuador things European or foreign in general are expensive and "kind" of expensive, but never the less I do my shopping at great stores, as of right now, I'm waiting for an antique store that will call me to go see their new arrivals...can't wait!!! Thank you for dropping by pretty Jo and for the nice comments and you're so very welcome to come by and use your "voyeuristic" skills on my house! Yeah, that fixture is nice, it's Italian and I have other posts where you can see it in full. Come by and see my: Another Dinnerware Design, just before this last one. I'm going to go look around yours as well. OH! I'm also your follower! Hope you like my blog enough to follow me. Oh Jo! You found some AMAZING treasures!! I love all of them! Those candlesticks that hold the matches are absolutely wonderful!! I also pickup faux flowers and candles at thrift stores. They are so expensive in the regular retail stores. Great finds! Have a wonderful day! Good finds. I also constantly watch for beautiful "things". Our local thrift store is the best place to shop as far as I'm concerned.